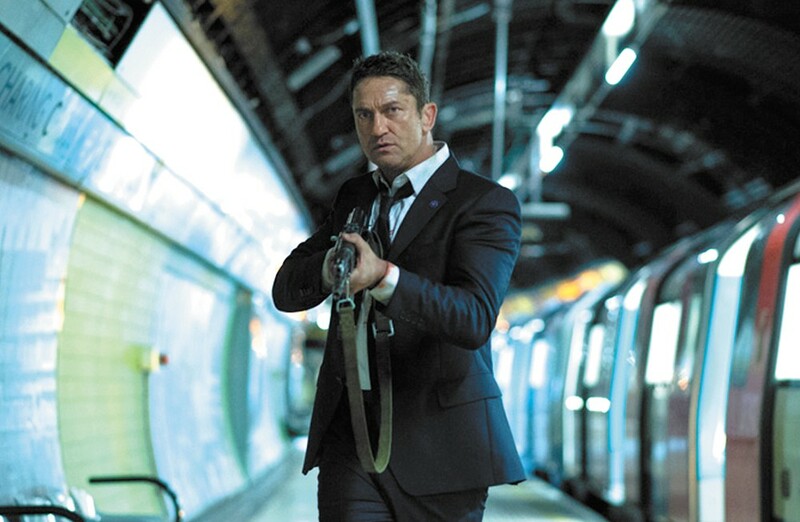 Gerard Butler fires away, but misses. If only all those other stupid countries could be as awesome as America. After the British prime minister dies suddenly and mysteriously, world leaders summoned to London for the funeral, allegedly "the most protected event on Earth," come under terrorist attack. Now Asher and Banning are on the run in a locked-down London because the bad guys want to capture the president and execute him live on the Internet. Because that could happen. It is laughably beyond preposterous — all the security lapses in every single British service, from MI6 right down to the NHS ambulance corps — that are required for the army of swarthy brown terrorists to pull off stupendously coordinated multiple attacks across a geographically sprawling world city. Though even the terrorists cannot deny the superiority of American technology: look at all the Macintosh PowerBooks prominently arrayed among their info-arsenal! Of course, the Brits are not American; all the pitying glances and asides thrown around by the likes of Secret Service director Lynne Jacobs (Angela Bassett) for her UK counterparts are akin to that of a patient parent generously tolerating the best efforts of a slow but beloved child. Isn't it cute how the Brits are trying? So sweet of them. London Has Fallen is not showing in any theaters in the area.